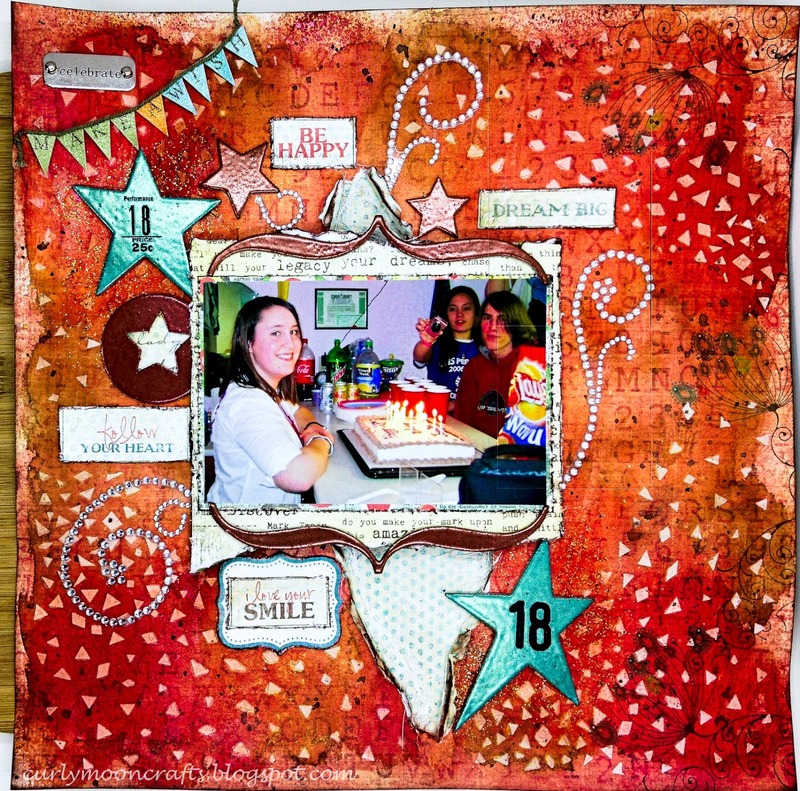 Hi Friends: Today's post is scrapbook layout of my daughter's 18th birthday - yes, I am always behind on my scrapbooking, but I don't work chronologically, so it's OK. LOL. Please see below for process, challenges, and supplies. Have a super day! I prepped my background paper with clear gesso, then used a confetti stencil with white embossing paste to add texture to the background. When dry, I sprayed the background with different colors of coordinating LSG sprays to add some shimmer. In the area under the photo, I ripped the paper and added a coordinating paper behind it, then added cheesecloth to the ripped area. I matted the photo with coordinating papers that were inked and distressed, and used scrap cardboard to lift it off the page. I heat embossed the chipboard shapes with coordinating LSG embossing powders, added some rub-ons to the large stars (it was her 18th birthday), then arranged them around the photo. To enhance the bling around the stars, I added some glass bead glitter gel. I cut words from one of the coordinating papers, inked the edges and arranged them around the photo, too - I love how these words worked perfectly with my wishes and feelings for her that day. I edged the background papers and the ripped area with brown chalk ink, then finished the page off with the bling, the celebrate charm, the wish banner, and some splatters made with black gesso. Creating the layout was almost as much fun as the birthday party! What a lovely layout to remember your daughter's birthday. A beautiful take on the challenge. Just a quick note - Like you, I don't scrap chronologically and don't intend to capture every eventful moment either. I say scrap whatever inspires you at that very moment. To me it's the joy of creating something and expressing what I feel when I create. I don't care about scrapping the same pictures many times or if some never makes it to a page cause when I scrap it I relive that moment or simply enjoy communicating my emotions. Others use it to record memories for future generations.It is different for all of us and there is no right or wrong way :) Just thought I'd share to let you know that you don't have to feel like you are behind. I remember too well how much I tried to record everything and how the need to scrap a certain event or photo dampened my mojo. But hey that's just me 😉 Thank you so much for joining us here at More than Words. Fabulous layout - you captured the moment perfectly. 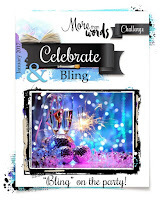 Thanks for joining in at Simon Says Stamp Wednesday Challenge this week. Beautiful, very bright and colorful! Thanks for joining us at More Than Words! Such a wonderful mmemory & you have scrapped it beautifully Patti. Also totally agree with everything Anguree said about not keep it all in order, doesn't really matterone way or the other because I am sure your family will treasure them regardless. Thanks for playing along with us at More Than Words. I agree with Anguree too! Scrap whatever takes your fancy I say! You've created a really fab page here - I adore the bright colours! Thanks for joining in at More Than Words this month. Beautiful entry! I love your page! Thank you for playing with us at MTW challenge. This is such a fun page! A wonderful documentation of happy times! Lovely! Thank you for playing along with us at More Than Words!